Did you ever have the urge to create a one of a kind piece of furniture, let your imagination run wild, come up with concept, design, color for wood finish and all the details only to find your idea cannot come into fruition due to the limitations in the capacity of your freight elevator or door way entrances? Well... Our crew can make the impossible, possible. We were recently working with a repeat client of ours who has relied upon us for design assistance, measuring, room plans and color selection for their bar area, living room, sitting area and dining room. This client has a large open dining area shared with the living space and wanted a grand dining table to be able to host large dinner parties, family occasions and holiday affairs. 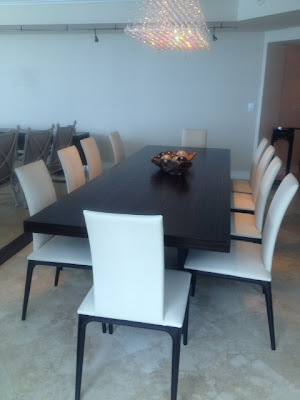 After we measured for her, we concluded a 120'' fixed solid wood dining table in exotic ebony would be perfect. We picked out gorgeous matching dining chairs in ebony wood and ivory leather to coordinate with the American Leather Feliz swivel chairs we used in the sitting area in the same open space from the dining room. Prior to placing the custom order from Italy, we wanted to make sure we would be able to get this extra large, one piece, 120'' dining table into their high-rise condo. 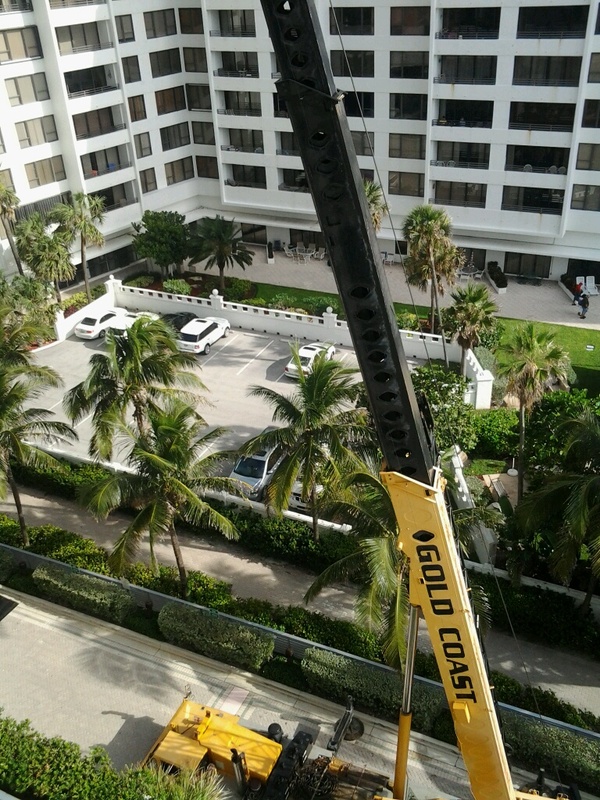 Our delivery crew inspected the receiving space and found the elevator was exactly 10ft. This left us without an inch to spare for wrapping the table top to protect it from damages in the elevator. That was not an option. The next idea... up 8 floors, poolside, through the balcony, into the sliding glass doors off the living room. Could it be done? 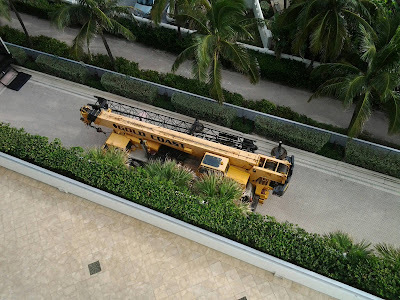 Well, we had our crane crew and white glove delivery team inspect the territory to make sure we can go from ground up for a safe and secure delivery. Long story short, we were not taking no for an answer. Our client wanted a 10 ft table, we were going to get her a 10 ft table! 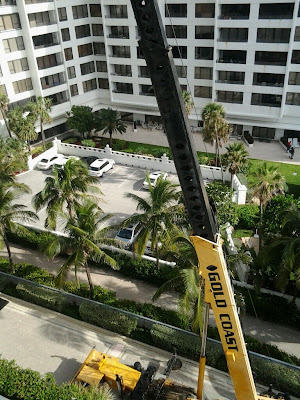 Post delivery shot: Nothing like getting a solid 120" dining table up 8 floors, through the balcony, then into the dining room with a crane! We've got you covered with whatever you need! Only through Wasser's and ONLY with my daughter Jaime & son Josh facilitating logistics & 3rd generation incomparable customer service.